It’s regarded as one of the most iconic pieces of Hip Hop jewellery in the world and has since been a symbol of religion/spirituality for those involved in a world of cruelty and “gangster” lifestyles. Now the reason why most headz recognize the iconic Jesus Piece so well may be that it has been seen around the necks of your favourite stars. However only a few actually know about the origins and history of it but, through looking down a simple timeline, you will realise that this Holy Bling has been around longer than you thought. Let’s get schooled! “…Did Yeezy not get signed by Hov and Dame, Ran to Jacob’s and made the new Jesus Chains…” (Kanye West – New God Flow) Whilst most of us actually got introduced to the Jesus Piece through Kanye West, it was not created by him. It was he who pushed it to the max (think about it). Having collaborated with the famous Jacob The Jeweller in 2004, creating a line of religious-themed jewellery, it would be the right thing to say that the two worked on the Jesus Piece and ‘improved it’, which still however begs the question:”Who is the creator of the Jesus Piece?”. Although Yeezy and Jacob are usually credited with inventing it, headz may recall seeing a similar piece around the neck of the Notorious B.I.G. in the mid-1990s. Having even rapped about it in the joint “I Love the Dough” on his famous Life After Death album in 1999 with the lyrics “You seen the Jesus…Even got rocks in the beard and moustache”. The pendant is believed to have been created by the original OG designer, Tito, and even though currently the iconic Jesus Piece features a crown of thorns encircling a flowing mane of hair with Jesus also depicted with a thick beard and compassionate eyes, originally the Piece was iced out with precious metals and gemstones, from diamonds in the hair to ruby tears running down his face. Jay-Z even managed to scoop himself the Jesus Piece rumoured to be the same one owned by Biggie, as Jay appeared on the cover of XXL in December 1999 wearing it long before Kanye and Jacob jumped on it in 2004. 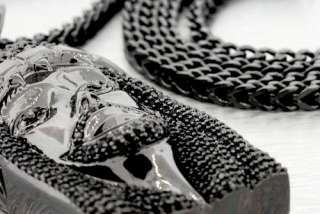 The Jesus Piece has been embraced by Hip Hop as a way to share a belief with the world and has arguably become one of the most important pieces of jewellery in the Hip Hop fashion industry. Although the piece has encouraged the creations of other Jesus jewellery and accessory pieces including a rosary-inspired necklace that features the Jesus head and a dramatically dangling, iced or beaded rosary that ends with either a crucifix or a second Jesus head, none is better than the original Yo! Shout-out to OG designer Tito and another Shout-out to Yeezy for that Jesus Piece love…huh!